I very reluctantly started running at the age of 22 after being talked into it by a friend. I was quickly hooked. During the years that followed I ran many races as a club runner, including cross-country, summer and winter league races, the occasional Tough Guy-type race, and even a fell run. At the age of 28 I completed the Great North Run in just under two hours. I have kept up running on and off over the years despite suffering a ruptured calf muscle that prevented me running for two years. Then, about four years ago, I sustained a nasty lower-back injury and resigned myself to doing light exercise and weights at the gym and sadly stopped running altogether. In January 2016 I had a cancer scare. While waiting for the results of tests I decided that, no matter what the outcome, I would enter the Great North Run and run it for Cancer Research UK. Thankfully the tests came back negative. I began my training despite the sometimes severe back, hip and calf pain. I completed the race at the age of 48 in 2hrs 45mins. Now, after a few months of rest, I’m just starting to slowly run a couple of miles, three times a week. I may never race again, but the fact that I can run, even if I have to be careful and monitor how my body is bearing up, is a blessing. 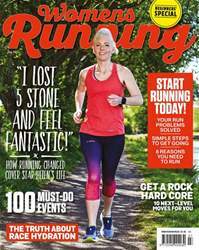 Start running today with the July issue of Women’s Running magazine, on sale now! In this beginners' special, we've got a step-by-step guide to going for your first few runs, with expert input from coaches and advice from the Women's Running team - trust us, we've been there! Resident GP Dr Juliet McGrattan helps you overcome your barriers to running, and we'll also give you eight great reasons to start today. Already a runner and need to step things up? We've got an eight-move Pilates workout for you, plus for the dedicated athlete, we'll show you 10 next-level exercises to strengthen your core. Plus, don't miss part two of our 2017 Ultimate Race Guide, detailing 100 must-do races from now till December.